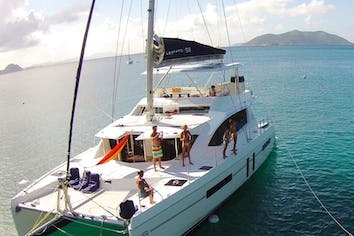 DESTINY, a German Frers designed 70 footer can accommodate 6 guests in three spacious cabins. The master cabin is equipped with an en-suite bath, shower, a king-size bed and a flat screen TV, while two other cabins share a full bath with a spacious shower, a 64' queen size bed and a double bunk. Both of them equipped with a sound system, flat screen TV and air conditioning, which makes it perfect for a family or friends vacation. With spacious and smart layouts and solid hull design, DESTINY is built for comfortable cruising and long distance sailing. 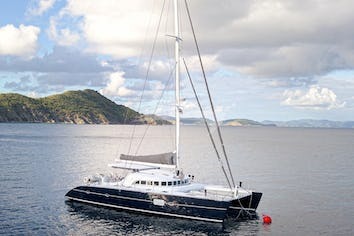 She has been maintained to the highest standard and has been recently refitted and upgraded with a new boom and mainsail. Internet connection via satellite - everywhere at guests' expense. SSB, email, cell phone, Satelilite phone, fax. Captain Rob has been sailing since childhood, working his way from deckhand to second mate, first mate, and more recently to captain of a 170-foot sailing yacht. His love of the ocean and a passion for providing customer service make him an ideal captain for S/Y Destiny. Taylor has been working on yachts for five years in positions including stewardess, sous chef and chef. This enthusiastic and hardworking lady is also skilled and certified in scuba diving, powerboat operation, jet ski instruction, and STCW 95. We had a great time, I can't say enough about how great ourtrip was. The crew were very professional. Top notch. Food was fantastic. We should not hesitate to recommend DESTINY to any client. Thank youf or helping put this trip together for us on board DESTINY. Guys, we had a great time and can’t thank the two of you enough. It was so relaxed and invigorating at the same time. The kids had a blast with all the activities arranged by Mike, and the food prepared by Shivani was outstanding. It was an experience of which the memories will stay with us forever.Thanks again for a truly memorable time. You were great with the kids and they’ll forever remember their time on Destiny! A short note to thank you for looking after us during our 11 days sailing on DESTINY. We really had a good tour of the BVIs, experiencing beautiful beaches on a number of islands . . . (and an) opportunity for some fine sailing. We are very grateful for your hospitality and a particular note towards Megan’s exquisite cooking which we all enjoyed. I would remind you that should you be in London, or passing close to Malta, do contact me to explore the possibility of visiting us. Everything was perfect! Captain and chef could not have been better. We liked them both and enjoyed their company. Delicious food!! 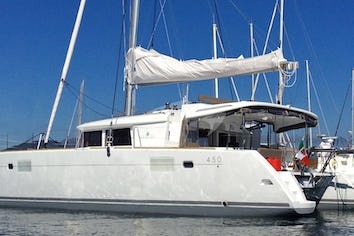 The Hylas 70 is a fine charter yacht. While I prefer a more classic yacht she is good looking. The cockpit is especially large and can be fully enclosed, including the helm area. Great access for boarding the tender. Accommodations are very adequate. Everything was perfect! Captain and chef could not have been better. We liked them both, and enjoyed their company. Delicious food!! The trip was absolutely perfect in every way. The boat was beyond amazing and surpassed only by the crew, they were the best you could hope for. I would recommend the Destiny and the crew to anyone . . . . our next trip . . . can’t be too soon. We got home last night and had a wonderful time. The boat itself was great! Gunnar and Megan did a great job. Megan is a great cook and has a lovely manner about her. Gunnar was a CAPTAIN! Very nice and eager to please. We all felt very safe with him. They were both also a lot of fun. We covered 8 islands in eight days, so we were active. We did have Christmas winds but we got used to it. All said we had awesome time on Destiny and we would definitely book them again.